Adding an air purifier to any room in your home or office can help eliminate allergens and odors from the air to make breathing easier, cleaner, and safer. 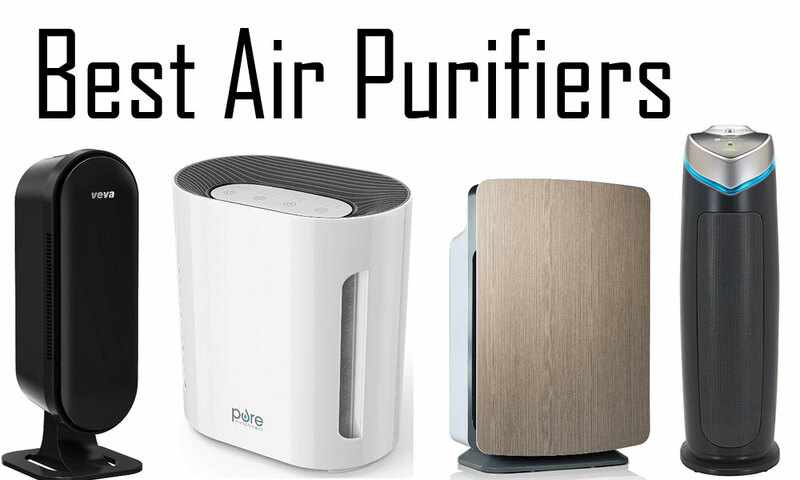 Allergies or no allergies, you can benefit from having an air purifier in the rooms where you spend the most time. An air purifier can transform your home or office to create a healthier, more pleasant environment for anyone around. Reliable and effective, these air purifiers are both functional and stylish with modern designs that are unobtrusive and won’t clash with your decor or become an eyesore. 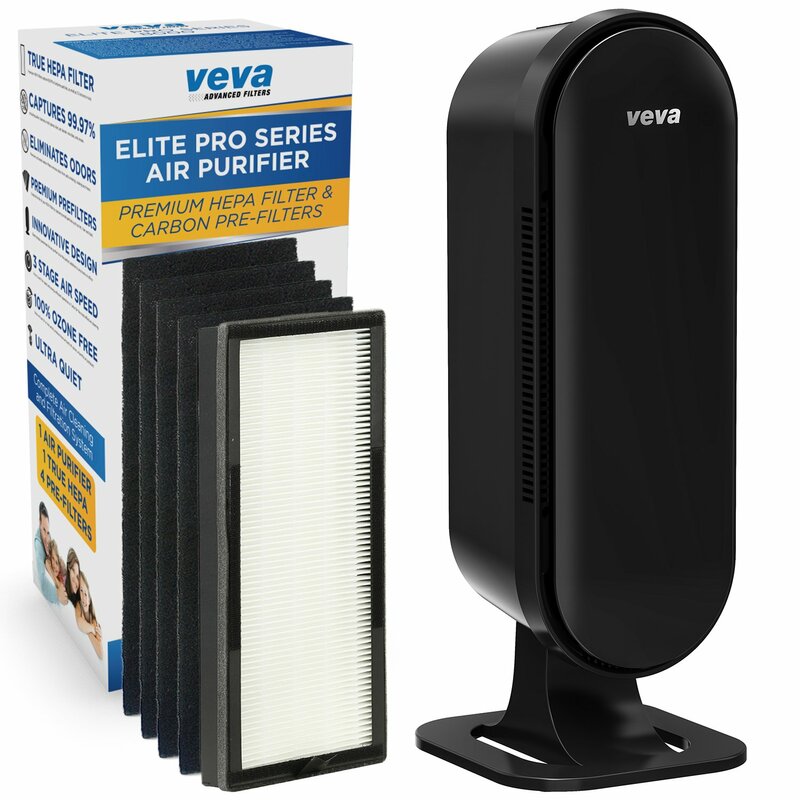 Equipped with a tree HEPA filter, this VEVA air purifier effectively strips the air of 99.97% of even the tiniest dust particles and common allergens like pollen and mold spores. Also, it features carbon filters that use activated charcoal to rid the air of unpleasant odors. Place this purifier in the kitchen to clear away the less delicious food scents that linger after cooking. Or, set it up near your pet’s cage or favorite hang-out spots to eliminate the odor of their waste. If you have multiple rooms that could use a little air purification but don’t have the budget to invest in multiple air purifiers at the moment, no problem. 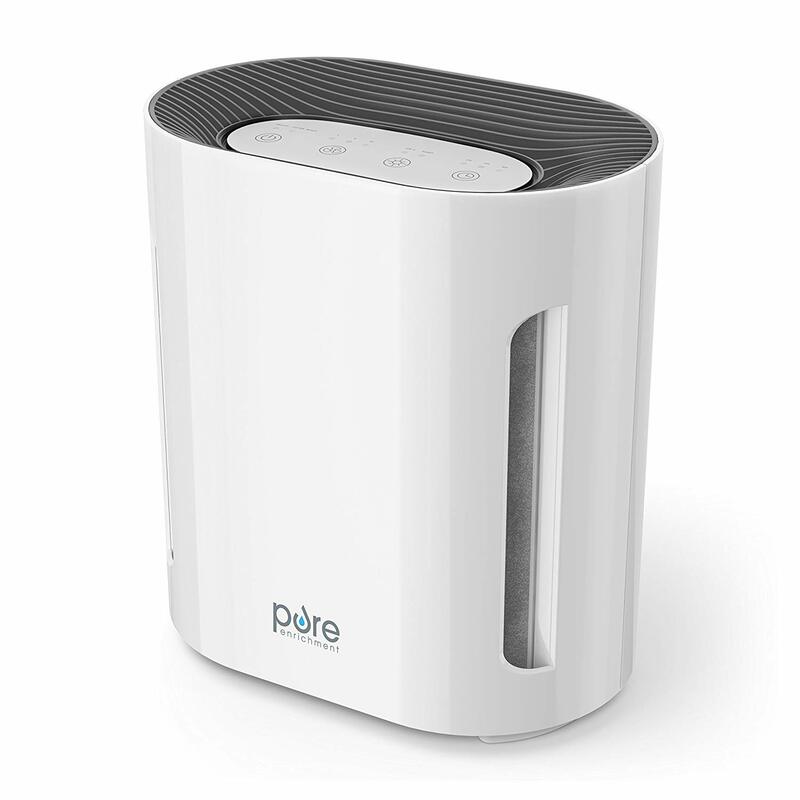 This lightweight, portable air purifier is built with a removable base that effortlessly transforms it from a tower purifier that you can place on the floor of your living room to a tabletop purifier that will fit on your nightstand or the desk at your office. As an added bonus, you’ll get four pre-cut activated carbon filter placements. These long-lasting filters only need to be switched out every six to twelve months depending on how often you use your purifier; each filter provides at least six months of purified air with maximum use. 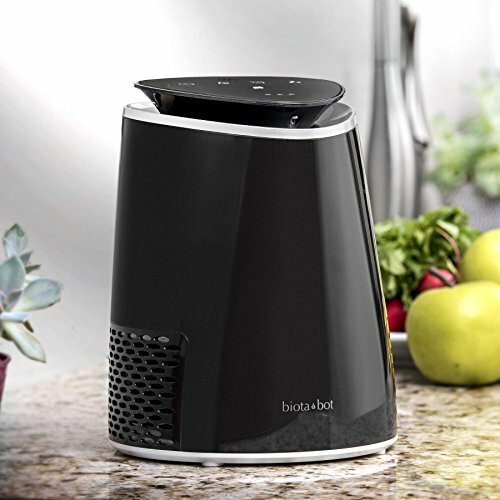 This mini but mighty Biota Bot air purifier is the cream of the crop when it comes to portable purifiers that don’t take up too much room but still manage to do their job well. It requires only about one square foot of space, but it still manages to remove 99.97% of dust and allergen particles from an entire room. This portable purifier is equipped with four different filters for maximum efficiency: an elementary filter for large dust and allergen particles, a HEPA filter for tiny particles like mold spores and pollen, an activated carbon filter for odor elimination, and a nano-mineral crystal filter for extra purifying protection. It uses special Smart Sensor Technology to automatically judge the air quality in the room and adjust the speed of the purifier’s fan accordingly. Also, the purifier comes with a built-in timer that turns itself off after two, four, or eight hours depending on the settings you choose in order to save energy and maintain optimal air quality. With enough power to purify 1100 square feet at once, this air filter is ideal for large rooms. It is perfect for open areas like your office waiting room, living room, or master suite. It is in these spaces where this purifier can really live up to its full purifying potential. Beyond that, this mighty purifier can purify all those square feet of dust and allergen particles as small as 0.3 microns in less than 30 minutes. You can also stay aware of the air quality in the room at all times with this easy-to-read Air Quality Indicator Light. 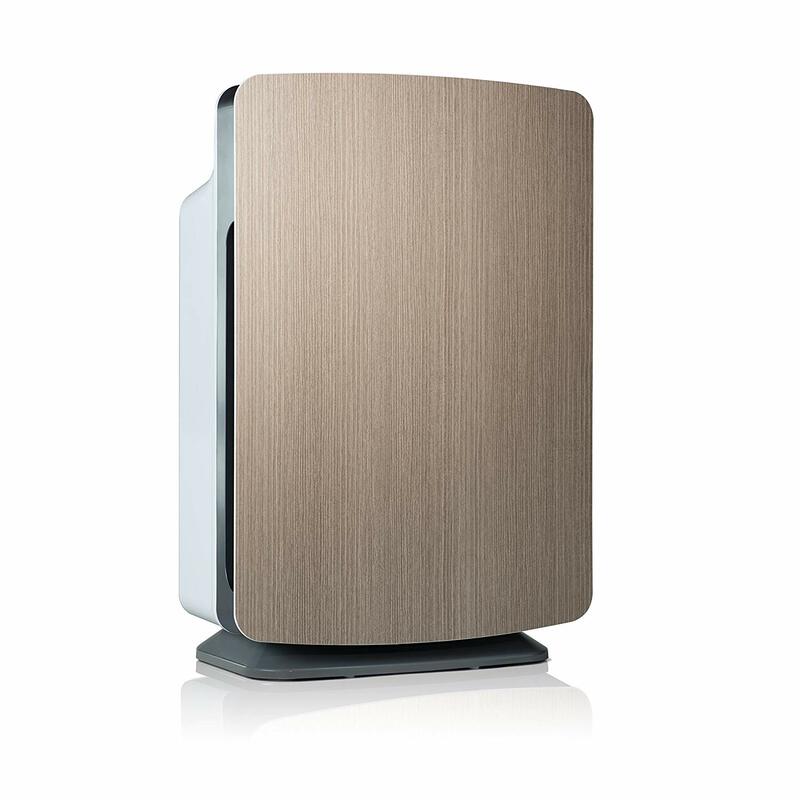 A sleek, slim design and availability in several neutral colors makes this purifier a stylish, unobtrusive addition to any room despite its large size and power. With a HEPA filter, charcoal filter, and UV-C light technology packed together in one sleek and efficient casing, this tower air purifier is a 3-in-1 miracle. Its HEPA filter detects and eliminates 99.97% of dust and allergen particles, even particles as small as 0.3 microns. Its charcoal filter efficiently removes odors from cooking or pet waste from the air. For extra purifying protection, this purifier features optional UV-C light technology. This light technology clears the air of more dangerous particles such as bacteria and mold spores. With a pre-filter, activated carbon charcoal filter, and HEPA filter, this 3-in-1 air purifier expertly removes dust, allergens, and odors from the air. Its UV-C light technology rids the air of more damaging and dangerous particles like viruses, bacteria, mold spores, and germs that contribute to allergies and illness. Also, the whisper-quiet operation of this air purifier won’t disrupt your sleep. It allows you to go about your daily life—awake or asleep—without even noticing the purifier is on. Since it is so quiet, this purifier features a built-in timer and turns itself off automatically in 2, 4, or 8 hours. This feature give you peace of mind in case you ever forget to turn the purifier off.